Tottenham Hotspur Stadium is a stadium that serves as the home ground for Tottenham Hotspur in north London, replacing the club's previous stadium, White Hart Lane. It has a capacity of 62,062, making it one of the largest stadiums in the Premier League and the largest club stadium in London. It is designed to be a multi-purpose stadium and features the world's first dividing, retractable football pitch, which reveals a synthetic turf pitch underneath for NFL London Games, concerts and other events. The construction of the stadium was initiated as the centrepiece of the Northumberland Development Project, intended to be the catalyst for a 20-year regeneration plan for Tottenham. The project covers the site of the now demolished ground of White Hart Lane and areas adjacent to it. The project was first conceived in 2007 and announced in 2008, but the plan was revised several times, and the construction of the stadium, beset by disputes and delays, did not commence until 2015. The stadium was subsequently completed and opened on 3 April 2019 with a ceremony before the first competitive Premier League game held at the stadium. The name "Tottenham Hotspur Stadium" is temporary, the intention being to sell the naming rights to the stadium, so that it will be named after a sponsor. The stadium is occasionally referred to as New White Hart Lane by fans and some in the media. Aerial view of White Hart Lane, demolished in 2017. A great part of the area in view would be redeveloped in the new stadium project. Tottenham Hotspur was formed in 1882, and the early matches of club were played on public land at Tottenham Marshes. As the matches became more popular with the public and the number of spectators increased, the club decided to move to an enclosed ground so that it could charge an entrance fee and control the crowd. In 1888, the club rented a pitch at Asplins Farm, next to the railway line at Northumberland Park. However, the ground became overcrowded, and in 1899 the club moved to a piece of land to the east of Tottenham High Road, behind the White Hart pub, owned by the brewery company Charringtons. This would become the White Hart Lane ground. The club acquired the freehold of the ground, as well as additional land at the northern (Paxton Road) end, in 1905. Starting in 1909, a stadium, with stands designed by Archibald Leitch, was built over a period of two and a half decades. The stadium would have a capacity of nearly 80,000 by 1934. Over the years, the stadium underwent a number of changes and seating replaced the standing areas, which reduced the capacity to about 50,000 in 1979. Significant standing areas, however, still existed, including the long stretch of raised standing terrace favoured by fans on the East Stand known as The Shelf. Beginning in the 1980s, the White Hart Lane ground was redeveloped, and in order to comply with the recommendation of the Taylor Report, it was turned into an all-seater stadium. The capacity of the stadium was reduced to around 36,000 by the time it was completed in 1998. The capacity was, by then, lower than other major English clubs, with many of these clubs also planning to expand further. 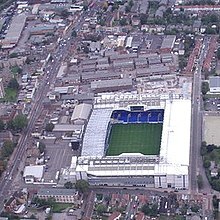 As revenues from gate receipts in that period formed a substantial part of the club's income (before it became dominated by TV broadcast rights deals), Tottenham began to explore ways of increasing the stadium capacity so that it could more effectively compete financially with rival clubs. Over the years, a number of schemes were considered, such as rebuilding the East Stand as a three-tier structure and moving to different stadiums and locations, including Picketts Lock and the Olympic Stadium at Stratford, London. These plans however failed to come to fruition, except for a proposal to redevelop the existing site that became the Northumberland Development Project. The club first announced in 2007 that it was considering redevelopment of the current site as one of the options under consideration. In April 2008, the club revealed that it was considering the acquisition of the Wingate Trading Estate immediately adjacent to the north of White Hart Lane for building the stadium. In October 2008, the Northumberland Development Project, that included the construction of a stadium, as well as a club museum, homes, shops and other facilities, was announced. The early plan was for Tottenham to move into the new stadium, while it was partially built, at the beginning of the 2012–13 season, with the stadium completed by the end of the following season. However, the project was delayed, with the plan undergoing a number of revisions and the completion date pushed back several times. The club also did not fully commit itself to building the stadium in Tottenham until January 2012, after it had lost its bid to use the Olympic Stadium to West Ham United. The first plan of the project, with a 58,000-capacity stadium, was released in April 2009 for public consultation. In October 2009, the planning application for a 56,000-seat stadium, designed by KSS Design Group, and other buildings was then submitted. The proposal, which included the demolition of eight locally listed buildings and two nationally listed buildings, was criticised by conservation groups including English Heritage, as well as the Government's advisory body on architecture, the Commission for Architecture and the Built Environment. In response to the objections, a revised plan, that retained some of the listed buildings, was resubmitted in May 2010. This plan was accepted by Haringey Council on 30 September 2010, and later by the Mayor of London, Boris Johnson, as well as the government. However, only part of this plan, the construction of Lilywhite House, was implemented. In August 2011, a major riot erupted in a deprived area of Tottenham. Haringey Council, keen to keep the economically-important club within the community, issued planning permission for the project on 20 September 2011, and a week later removed the demand for community infrastructure payments usually required for such a project. In a joint statement with Haringey Council in January 2012, Tottenham announced that it would stay in North Tottenham and work with the council to rejuvenate the area. In this scheme, the Northumberland Development Project would serve as the catalyst for a 20-year regeneration program planned by the Haringey Council. In March 2012, Haringey Council approved of plans to hand over council-owned land in the redevelopment area, including part of Wingate Trading Estate, as well as Paxton Road and Bill Nicholson Way, to Spurs. It also agreed on a Compulsory Purchase Order (CPO) to buy the remaining properties on Paxton Road that had yet to sell. After a long delay, the Secretary of State for the Department for Communities and Local Government, Eric Pickles, confirmed the CPO on 11 July 2014. The owner of the remaining business with two plots on the development site, Archway Sheet Metal Works, then attempted but failed to have the CPO decision quashed in the High Court. On 31 March 2015, the remaining plots on Paxton Road were acquired, allowing the development to proceed. In October 2013, it was revealed that the club was considering a new plan for a multi-use stadium that can host American NFL games. On 8 July 2015, it was announced that the club had reached an agreement with NFL to hold a minimum of two NFL games a year in a 10-year partnership. The same day a new design team was also announced, alongside a revised project plan, with Populous led by Christopher Lee responsible for the stadium design. In December 2015, the revised plans were approved by Haringey Council, including the demolition of locally listed buildings. The Mayor of London also gave formal approval to the plans in February 2016. Northern section of the new stadium (left) under construction in May 2017, with White Hart Lane (right) partially demolished. The new ground covers part of the old ground. The construction for the Northumberland Development Project started in September 2012, however, construction of the stadium itself did not commence until 2015 due to the CPO dispute. The stadium was constructed in two main phases so that White Hart Lane could still be used in the 2016–17 season while the construction was in progress. The first phase involved the construction of the northern section of the stadium (including the North, West and East Stands), while the South Stand construction started in the second phase, after White Hart Lane had been demolished. A large part of the land north of the existing stadium had been cleared by 2014 while the CPO dispute was ongoing. After the dispute was resolved, preliminary work on the basement began in the summer of 2015, with concrete and ground works for the foundation by Morrisroe starting in autumn 2015, based on earlier approved and amended plans. The new plan for the project was given final approval in February 2016, which allowed the construction of the main structure of the new stadium itself to start soon after. In order to facilitate the construction of the northern section of the stadium while matches of the final season were still being played at The Lane, the northeast corner of White Hart Lane was demolished in the summer of 2016 after the 2015–16 season had finished. From the basement to level 6, the construction of this section is in reinforced concrete. Three further levels above are constructed in steel frame. There are only six cores in reinforced concrete for vertical circulation of spectators instead of the eight expected of a stadium of this size as they needed to be constructed within the first phase of the stadium construction. The South Stand constructed in the second phase has open staircases to the concourses. The demolition of the majority remaining White Hart Lane ground began the day after the last home match of the 2016–17 season was played, and the demolition was completed with all visible remnants of White Hart Lane removed by early August 2017. Piling work for Phase 2 of the stadium construction started in June 2017. While the northern section constructed in the first phase is a largely concrete structure, the entire single-tier south stand has a steel frame to allow for a speedier construction. The two steel "trees" that support the South Stand were erected in December 2017. The compression ring that holds the cable net roof structure was completed in February 2018, and the roof structure raised in March 2018. Stadium nearing completion in February 2019. Last section of metal cladding panels being installed. Parts of the old White Hart Lane have been incorporated into the new stadium – crushed aggregate of the concrete foundation of White Hart Lane was mixed in with new concrete to create the floor of the concourse of the new stadium, and bricks from the East Stand were used for the Shelf Bar. A number of heritage plaques are placed around the stadium marking points of the old stadium, such as its centre. The pitch was laid in early October 2018. The exterior of the stadium is finished with 35,000 decorative tiles, 4,801 perforated metal panels and 2,505 glass panels. The external cladding of the stadium was completed with the last few metal panels of the 'veil' installed in March 2019. The club initially announced that it would hold four test events at the stadium in August and early September 2018. The first two events would be attended only by club staff and officials, the following two would be games open to the public, with increasing levels of attendance necessary for the issuing of safety certificate. However, issues with the critical safety systems due to faulty electrical wiring delayed the completion of the stadium, and these two games were postponed to March 2019. A fan familiarisation event was held instead at the stadium in December 2018. The first match, an under-18s fixture between Tottenham and Southampton held on 24 March, was attended by 28,987 fans and won by Tottenham 3–1, with the first ever goal at the stadium scored by J'Neil Bennett. The second, a Legends match against Inter Milan on 30 March, was attended by 41,244, but resulted in a 4–5 loss to the Inter Forever team. The opening was originally planned for the second home match against Liverpool in September 2018, but delays to the opening of the stadium forced Tottenham to extend their temporary tenancy of Wembley Stadium for the 2018–19 season until April 2019. They also played their home game in the third round of the EFL Cup at Stadium MK. The first NFL game was due to be Oakland Raiders against Seattle Seahawks on 14 October 2018 but this too was relocated to Wembley following the stadium delay. The club shop was the first to open on 23 October 2018. The stadium opened with a ceremony on 3 April 2019 before its first competitive senior game, the Premier League match against Crystal Palace. The match was won by Tottenham 2–0, with Son Heung-min scoring the first ever official goal at the new stadium. On 9 April 2019, the stadium hosted its first ever UEFA Champions League match in the quarter final against Manchester City. Tottenham beat Manchester City 1–0 with a goal from Son Heung-min in the 78th minute. The match registered the attendance of 60,044 against a full capacity of 62,062 fans. The stadium is an asymmetric bowl, with a capacity of 62,062. The bowl shape of the stadium comes from the need to maximise hospitality facilities while the asymmetry is the result of the creation of a single-tier stand in the south. The stadium is around 48 m high, 250 m long on its north-south axis and about 200 metres wide east to west. There are 9 floors in the northern section above the basement, and 5 floors in the south, with a gross internal area of 119,945 m2, which is around four times the size of White Hart Lane. The front of the West Stand faces the High Road and features a projecting, angled, glazed box that encases an escalator and serves as the main entrance for guests and patrons. The projecting entrance, along with the facades of other buildings of the Tottenham Experience, present a traditional linear frontage along the High Road. A 9.5-m pavement is created in front of these buildings to improve the flow of the crowd on match day on the High Road. To the east, on Worcester Avenue, is a dedicated entrance for NFL events. There are two raised podiums for fans access, one to the north and one to the south. A large open public square, the size of Trafalgar Square, has been created on the south podium as the main access point for home fans. The square has a number of ventilation shafts, and it may be used for sporting and community activities. Away fans may enter from the northeast corner of the stadium via Worcester Avenue and the north podium. The South Stand features a 5-storey atrium behind a single 7,000 m2 curved glazed facade. The bulk of the structure dominates the surrounding area, but the appearance of the mass of the building is modulated by different claddings of glass, metal panels and pre-cast concrete. The perforated metal panels work as a screen but allow for natural ventilation and light for the open plant areas in the stadium, and they also act as a unifying sculptured element in the appearance of the stadium. Regions of glazing not covered by the metal screen, including the main entrances and concourses, offices, Sky Lounge, as well the extensive glazed area to the south, allow for views into and out of the stadium. The metal panels may be in an open or closed position, and they are lined with LED luminaires that glow on match nights. The roof is a cable net structure, held in place by an elliptically-shaped compression ring. The roof has a circumference of 720 metres, and it is clad in standing seam aluminium panels that end with extruded polycarbonate on the inside edge to allow light through onto the pitch but reduce the contrast of the shadow of the roof on the pitch. 810 curved alumininum eave cassettes connect the roof to the wall. The pitch is lit by 324 LED floodlights, arranged in 54 groups of six and attached to the columns of the roofing system. There are four large LED screens inside the stadium, the two on the south side are the largest of any stadium in Western Europe. There are also two facade video displays on the outside of the stadium, three tiers of LED ribbon displays inside, and nearly 1,800 video screens in and around the stadium. The stadium is designed like a concert hall with good acoustics in mind so as to optimise the atmosphere on match day. The corners of the stadium are enclosed and the stands are placed close to the pitch, with fans generating a "wall of sound" that can reverberate around the ground. The design extends to the shape and material of the roof and the seating, and aims to produce cleaner and quicker reverberation times that allow fans to sing in sync thereby producing chants that are louder and last longer. The South Stand, also known as the Park Lane end, before the UEFA Champions League quarter-final with Manchester City F.C. on 9 April 2019, with fans displaying the club motto 'To Dare Is to Do'. Although the stadium is designed as a bowl, it still has four distinguishable stands. The tiers of the stands are set at angles of up to 35 degrees, the maximum permissible in British stadium design, and all seats provide clear views of the pitch for the ticket holders. The South Stand is designated the 'Home End', and it has a single tier which is the largest single-tier stand in the country, with seating for 17,500 fans. It is 34.1m high, has concourses on Level 1, 2, 3 and 4 and is accessible from the south atrium. The design of the South Stand is influenced by the "Yellow Wall" of Borussia Dortmund's Signal Iduna Park and the stand is intended to be the "heart-beat" of the stadium that can generate an intense atmosphere on match day. The 35.5m high North Stand has three tiers with concourses on Level 1, 2, 4 and 5. The East and West Stands are 33.8 m and 33.2 m high respectively, and have concourses on Level 1 and 5. Both stands have four tiers each, two of which are smaller and intended for premium seating. There are around 8,000 of these premium seats as well as 70 private loges and super loges for premium members and corporate hospitality. The total of 62,062 seats are in navy blue, with 42,000 of these reserved for season ticket holders. The seats have a minimum width of 470mm (compared with the 455–460 mm of the previous stadium), increasing to 520–700 mm for premium seats, with improved legroom. Away fans are allocated seats in the north east corner; 3,000 seats in the lower tier for Premier League games, while for domestic cups they may be allocated up to 15% of the capacity spread over three tiers. The stands include areas with 7,500 seats that can be quickly turned into safe standing areas should there be a change in the legislation that banned standing in football stadiums. A family area is located in the north west corner for those attending with their children. Disabled fans are catered for with 265 wheelchair bays, areas for assistance dogs and facilities for those with "complex care requirements". The accessible seating is available in all four stands, where the design allows for flexible seating for family groups. The association football pitch of the stadium has a standard dimension of 105m x 68m, same in size as the pitches at Old Trafford and Wembley Stadium, but 440 square metres larger than the pitch at White Hart Lane. The overall grass surface is 114.58×79.84 metres, including the perimeter between the pitch and the stands. The stands are placed close to the pitch so as to enhance the atmosphere on match days, and the distances between the stands and the pitch minimised – 7.97 metres (26.1 ft) from the front of the stand to the pitch on the west, north and east sides of the pitch and 4.985 metres (16.4 ft) at the south end of the pitch. The retractable pitch slides under the podium in the foreground, the trays for the pitch being installed are observable under the podium. In order to keep the football pitch in optimum condition, there are two different surfaces – a Desso GrassMaster hybrid grass pitch for football, and a synthetic turf surface underneath to be used for NFL games, as well as concerts and other events. The football pitch can be retracted in a way similar to that of the Arizona Cardinals' home stadium, but it is the first in the world to split into three sections before retracting. Each of the three sections weighs more than 3,000 tonnes, and is made up of 33 smaller trays, making a total of 99 trays, with a combined weight of 10,000 tonnes. The retracting pitch slides under the South Stand and the south podium, and the surface can be switched in around 25 minutes. The NFL pitch is placed 1.5 metres beneath the natural turf surface, and the change in height when the surface is switched also produces ideal sightlines for the front row for both codes. The stadium features the world's first integrated grow lighting system over the pitch. Grow lights are suspended on six 70-metre trusses to encourage the growth of the grass in the shaded areas of the stadium, and they can be folded away under the North Stand when not in use. The grass can also be maintained with an artificial lighting and irrigation system when the pitch is retracted under the south podium. The stadium provides separate facilities for football and NFL players; these include changing rooms, medical facilities, restaurants, hydrotherapy pools, warm-up areas, pre-match players' lounge, as well as lounges and creches for their families. It also caters for the different requirements of football and NFL media. There are a number of bars for fans on match day. In the South Stand is the Goal Line Bar, which at 65m is the longest in Europe. The White Hart and The Shelf are bars in the East Stand, while The Dispensary is found in the West Stand. The stadium offers a wide range of food and drinks outlets (65 at the club opening); in the South Stand is the 'Market Place' with a range of food and drink outlets, and a selection of food outlets are also available in other stands. Other features include an in-house bakery and the world's first microbrewery in a stadium, which can produce one million pints of craft beer a year and deliver up to 10,000 pints a minute. The stadium is the first cashless stadium in the country, it also offers stadium-wide connectivity for all the fans with more Wi-Fi access points and Bluetooth beacons as well as greater bandwidth than any other stadium. Some car parking spaces, but not for general admission fans, are provided underneath the stand and in the basement. A range of hospitality facilities in the East and West Stands are provided for those with premium memberships. These include two Sky Lounges on the top floor of the East and West Stands, with views over London and the pitch, the Sky Bridge, which is the world's first bridge to be suspended from the roof of a stadium, 65 suites of private loges and super loges, Michelin star level dining, and the Tunnel Club that allows its members to observe the players as they walk from the dressing room to the pitch through a glass-walled tunnel. The stadium is intended to be active all year round as a sports and entertainment destination with conference and banqueting facilities. It offers visitor attractions such as a Sky Walk, whereby visitors may walk up the side of the stadium, right up to the roof, and it has a viewing deck over the South Stand where they may view the goal line from the roof or abseil down to the south podium. The East Stand includes a double-height banquet hall that may be used for conference events. To the south of the stadium, the raised podium forms a large open public square that may be used for a range of sporting and community activities. The Tottenham Experience, which includes a club shop, club archive and museum on Tottenham High Road, serves as the arrivals hub for visitors, where they may collect tickets and start a tour of the stadium. The museum is located in the Grade II listed Warmington House, and the new club shop is the largest in Europe, featuring a 100-seat auditorium area that may be used for pre-match experiences. On the northwest corner is M cafe, a media room that may be open to the public and used as a cafe on non-match days. Other facilities may be offered in ancillary buildings surrounding the stadium, including a planned extreme sports building, a community health centre, and a ticket office. A 4.5-m-tall and near-double-sized replica of the spurs cockerel, originally created in 1909 to sit atop the west stand at White Hart Lane, was placed on the roof structure above the South Stand on 6 November 2018. A statue of Bill Nicholson will be placed on the south west approach to the stadium; the old gate to the West Stand from White Hart Lane will also be placed here, and the statue of Nicholson will be positioned at its centre, recreating a historic photographic image of Nicholson. The stadium is intended to be used for a number of purposes and will serve as the venue for association football as well as NFL games and other events. It will host up to 16 non-football events a year, two of which are NFL games, and up to six music concerts. The first NFL game will take place on 6 October 2019 when the Chicago Bears will play the Oakland Raiders. The rugby union club Saracens will also play their annual showpiece game at the stadium for five years starting in 2020. The stadium has a capacity of 62,062, but due to the need to segregate fans, the full capacity may never be reached for association football matches as some seats would be deliberately kept unused. The attendances are counted by the number of fans going through the turnstiles rather than the number of ticket sold used in some grounds such as the Emirates. The first match after its official opening, although sold out, was attended by 59,215 fans as some rows of seating were kept empty and some premium areas were not yet opened. An early estimate put Phase 2 of the development, that includes the construction of the stadium, at £305 million, but in July 2018, it was reported that the construction of the stadium itself was projected to cost £350–£400 million, out of the estimated £850 million cost for the entire Northumberland Development Project. The cost had increased due to the higher cost of import, caused by the Brexit vote, on the exchange rate, changes to the build, overtime working, extra hirings and higher construction costs. The cost of the project was widely reported to be over £1 billion, although the club had insisted that the final cost would be less than a billion. Just before the stadium opened in April 2019, the club chairman Daniel Levy said that the cost is of the order of one billion. The project was financed through a combination of club's own resources, bank loans and club revenues. A £200 million interim financing facility was arranged in December 2015 with three banks to finance the project. This was replaced in May 2017 by a £400 million, five-year loan, deal with the banks to fund the remaining build. By this stage, £340 million had already been spent on land acquisition and the planning process, as well as the construction cost; £100 million of this came from the 2015 interim financing, with the rest from club resources. However, with costs spiralling, the club was forced to borrow an extra £237 million, raising the financing facility to £637m. The NFL contributed £10 million to allow at least two NFL games per year in the stadium. The club aims to pay for the stadium through increased income from ticket sales, which is forecast to be £100 million per year and more than twice that earned from White Hart Lane, hospitality, sponsorship, merchandising, concessions, advertising and digital rights, and broadcast revenues. The club has a number of partners at the stadium. Following on tradition, Heineken, who have previously held sponsorship deals, have been named as the beer sponsor for the new stadium. The north London brewer Beavertown is the official craft beer supplier and it installed the world's first stadium-located microbrewery on the south east corner of the stadium. The company selected by the club to supply the advertising system in the new ground will be TGI. Tottenham signed a contract with LG to supply the new stadium with Ultra-premium TVs and digital signage. Hewlett Packard Enterprise is the IT networking and wireless infrastructure partner for the new stadium. The concessions for food and drink in the stadium are run by Levy, a subsidiary of Compass. The stadium is named Tottenham Hotspur Stadium until a naming-rights agreement is reached. The club is reported to be looking for deals worth £20m annually (£400 million for a 20-year deal or £200 million for ten years). The club estimates that the stadium would inject around £293 million a year into the community in Tottenham, and create more than 1,700 new jobs out of the total of 3,500 jobs to be created when the project is complete. The stadium is accessible via a number of London Overground, London Underground and National Rail stations: Seven Sisters, Tottenham Hale, Northumberland Park, and White Hart Lane stations. The nearest station, at around 200 m away, is White Hart Lane, which is on the London Overground line from Liverpool Street station. The station is being rebuilt, and a Wembley-style walkway for fans from the station to the stadium is planned. The next nearest is Northumberland Park and fans can reached the stadium via Park Lane. Both Seven Sisters and Tottenham Hale stations are stops along the Victoria line on London Underground. The walk to the stadium from Seven Sisters station takes around 30 minutes. Seven Sisters is a popular stop for fans which can cause congestion on match days. The stadium area is served by up to 144 buses an hour. Bus routes that stop close to the ground are 149, 259, 279, 349, and W3. A number of buses routes however are subject to diversions on matchdays. The club also operates two high frequency shuttle bus services to the stadium, one from Alexandra Palace via Wood Green (on Piccadilly line) and finishing at Haringey Sixth Form College, and the other from Tottenham Hale to Duke's Aldridge Academy. On match days, roads near the stadium are normally closed to traffic up to three hours before kick-off, and one to one and a half hours after the match. Car parking in the area is controlled on match days. ^ "Spurs stadium capacity increased to 62,062". Sky Sports. 5 March 2018. Retrieved 6 March 2018. ^ "Full Time Summary Quarter-finals 1st Leg – Tottenham Hotspur v Manchester City" (PDF). UEFA.com. Union of European Football Associations. 9 April 2019. Retrieved 9 April 2019. ^ a b Gilmour, Paul (3 April 2019). "Daniel Levy says Tottenham will become one of biggest clubs in the World". Sky Sports. Retrieved 5 April 2019. ^ a b Bickersteth, Rupert (4 April 2019). "Populous's Tottenham Hotspur Stadium – awe inspiring". Architects Journal. Retrieved 4 April 2019. ^ Ibbetson, Connor (4 April 2019). "Behind the scenes look at Tottenham's retractable pitch". New Civil Engineer. Retrieved 4 April 2019. ^ a b c White, Jim (22 March 2019). "Tottenham Hotspur's new home sets benchmark for modern stadia". The Telegraph. Retrieved 22 March 2019. ^ a b Collomosse, Tom (27 February 2018). "New Tottenham stadium will be called the 'Tottenham Hotspur Stadium' if club starts season without naming-rights deal". London Evening Standard. Retrieved 30 June 2018. ^ a b Luckings, Steve (3 May 2018). "The penny finally drops as Tottenham deal with spiralling costs of move back to White Hart Lane". The National. Retrieved 14 July 2018. ^ a b Morgan, Tom (30 August 2018). "Tottenham Hotspur struggle for £200m naming deal for new stadium". The Daily Telegraph. ^ a b de Menezes, Jack (14 June 2018). "Tottenham announce stay at Wembley Stadium and reveal first game at new White Hart Lane against Liverpool". The Independent. Retrieved 17 June 2018. ^ Flavius, Kevin (26 October 2018). "Tottenham Confirm New White Hart Lane Will Not Be Ready to Host Matches Until Next Year". 90MIN. Retrieved 30 October 2018. ^ Mannion, Damian (2 October 2018). "PITCH PERFECT Tottenham stadium news: Pitch being laid at new White Hart Lane ground and fans can watch it live". talkSPORT. Retrieved 30 October 2018. ^ Wallace, Sam (20 September 2018). "Workers on Spurs' new White Hart Lane stadium 'off their heads on cocaine' during construction". The Telegraph. Retrieved 30 October 2018. ^ Goodwin, Bob (2007). Tottenham Hotspur: The Complete Record (2 ed.). Derby Books. ISBN 978-1-85983-846-4. ^ Cloake, Martin (13 May 2017). White Hart Lane has seen Diego Maradona and Johan Cruyff, but after 118 years Tottenham have outgrown it. The Independent. ^ "Northumberland Development Project, Tottenham". Haringey Council. October 2009. ^ "History of White Hart Lane". Tottenham Hotspur. ^ Evans, Tony (13 May 2017). "The Shelf at Tottenham once made White Hart Lane London's most hostile stadium". Evening Standard. ^ Wilson, Bill. "Premier League finances enter new era, says Deloitte". BBC. ^ a b "Proposed New East Stand Redevelopment for Tottenham Hotspur Football Club" (PDF). Spurs Since 1882. June 2001. ^ Simons, Raoul (30 July 2003). "Spurs plan down the Tube". Evening Standard. ^ a b Collett, Mike (31 January 2012). "Spurs commit to new stadium in Tottenham". Reuters. ^ Young, Alex (24 January 2019). "New Tottenham stadium guide: Opening date, pictures, video, capacity, cost and more". Evening Standard. Retrieved 24 January 2018. ^ "Stadium Update". Tottenhamhotspur.com. 6 May 2008. Archived from the original on 9 May 2008. Retrieved 25 May 2008. ^ Hytner, David (9 April 2008). "Spurs consider White Hart Lane exit for 55,000-seat stadium". The Guardian. ^ "Tottenham Hotspur Confirms Northumberland Development Project". Tottenham Hotspur. 30 October 2008. ^ "Spurs reveal images of new ground". BBC Sport. 15 December 2008. Retrieved 16 December 2008. ^ "Tottenham Hotspur stadium plan drops hotel for college and more flats". Tottenahm and Wood Green Journal. 25 January 2012. Archived from the original on 21 February 2015. Retrieved 29 May 2013. ^ "Tottenham stadium delay means club face season away from home BBC Sport website 10 December 2014". BBC. Retrieved 20 February 2015. ^ Bright, Richard (1 April 2009). "Tottenham's new stadium could have an ice rink". The Telegraph. ^ Sheringham, Sam (26 October 2009). "Spurs aim for new stadium by 2012". BBC. ^ Richardson, Sarah (18 November 2008). "Make and KSS to design Spurs stadium". Building. ^ Allen, Felix (20 May 2010). "Spurs try again as £400m stadium plan is ruled offside". Evening Standard. ^ "Tottenham's plans to redevelop White Hart Lane shown red card". Times online. Archived from the original on 28 May 2010. Retrieved 22 May 2010. ^ "15 historic buildings set for demolition under Spurs stadium plans". SAVE Britain Heritage. ^ Thomas, Lyall (2 October 2014). "Premier League: Tottenham press ahead with stadium plans". Sky Sports. ^ Ley, John (20 May 2010). "Tottenham redesign new stadium to preserve listed buildings". The Daily Telegraph. Retrieved 15 June 2018. ^ "Tottenham given go ahead to redevelop White Hart Lane by Mayor of London Boris Johnson". The Telegraph. 25 November 2010. ^ "Stadium Plans". THFC Official website. Archived from the original on 3 October 2010. Retrieved 15 June 2018. ^ "New Stadium Plans Update". Tottenham Hotspur. 9 December 2010. ^ "Club Announcement". 16 February 2015. ^ a b Kilpatrick, Dan (30 July 2018). "New Tottenham stadium 'not possible' without 2011 London riots". The Evening Standard. ^ "Northumberland Development Project Update". Tottenhamhotspur.com. Archived from the original on 24 November 2011. Retrieved 20 September 2011. ^ "Tottenham sign planning agreement to build new stadium". BBC. 20 September 2011. ^ "Club reveal next stage plans for Northumberland Development Tottenham stadium: Club offered White Hart Lane deal". BBC. 28 September 2011. Retrieved 18 November 2011. ^ Thain, Bruce (31 January 2012). "Spurs confirm intention to stay in Tottenham and help rejuvenate the area". Enfield Independent. ^ "A Plan Tottenham" (PDF). Haringey Council. 2012. ^ a b "Project Update". THFC. Archived from the original on 14 July 2015. Retrieved 12 July 2015. ^ Bevan, Robert (25 March 2014). "Tottenham in £1 billion turnaround". London Evening Standard. ^ Lamden, Tim (March 29, 2012). "Spurs granted right to remove final business in the way of new ground". Tottenham and Wood Green Journal. Archived from the original on 15 February 2013. ^ Bryan A. (29 March 2012). "Another Obstacle Between Tottenham Hotspur and Their New Stadium Falls". Cartilage Free Captain. ^ "New Tottenham Hotspur stadium scheme gets the green light". Department for Communities and Local Government. 11 July 2014. Retrieved 12 July 2014. ^ "Northumberland Development Project - CPO Confirmed". Tottenham Hotspur. 11 July 2014. Retrieved 12 July 2014. ^ "Tottenham plans for new stadium given massive boost as business looking to block move loses High Court appeal". Daily Telegraph. 20 February 2015. Retrieved 20 February 2015. ^ "Joint Statement". Tottenham Hotspur Football Club. 31 March 2015. Retrieved 31 March 2015. ^ "Chairman'S Message". Tottenham Hotspur Football Club. 16 May 2015. ^ Waite, Richard (24 October 2013). "Tottenham Hotspurs' secret plans for White Hart Lane mega stadium". The Architects' Journal. ^ Wilson, Jeremy (8 Jul 2015). "Tottenham sign deal with NFL to stage American Football matches at new 61,000-seater stadium". The Telegraph. ^ Edwards, David (3 June 2016). "Architect Christopher Lee from Populous talks modern stadium design". The Telegraph. Retrieved 31 January 2019. ^ "Tottenham Hotspur Football Club Stadium Development". Haringey London. ^ Long, Sam (25 February 2016). "New Tottenham stadium: Mayor of London Boris Johnson gives formal approval to Spurs redevelopment". Evening Standard. ^ "Football news in brief". The Guardian. 13 July 2014. ^ "Project Update". Tottenham Hotspur. Archived from the original on 14 July 2015. ^ "Final go-ahead for £400m Spurs stadium". Construction Enquirer. 25 February 2016. Retrieved 16 June 2018. ^ "Tottenham Hotspur Football Stadium". Morrisroe. Retrieved 16 June 2018. ^ "Online Planning Services". Haringey London. Retrieved 16 June 2018. ^ Menno, Dustin (6 May 2016). "Tottenham Hotspur confirms upcoming partial demolition of White Hart Lane stand". Cartilage Free Captain. ^ "Stadium Construction Update - Latest Aerial Photos". Tottenham Hotspur. 17 August 2016. ^ "Environmental Statement". Haringey Council. September 2015. ^ a b Jones, Tom (17 May 2017). "Home Sweet Home: Tottenham Hotspur's last match at White Hart Lane". Populous. ^ a b c "Tottenham Hotspur Design and Access Statement 2015: 7.1 Stadium Design Concept". Haringey Council. ^ Gold, Alasdair (4 August 2017). "Spurs release brilliant time-lapse video showing new stadium progress and how it will look". football.london. Retrieved 17 October 2018. ^ Hein, Thomas (11 November 2017). "Tottenham Deploy 'Trees' In New £850m Stadium To Take The Weight Of The South Stand Which Will Be The Largest In Europe". ^ "New Stadium Update: Commencement of Roof Lift". Tottenham Hotspur. 8 February 2018. ^ Gold, Alasdair (26 March 2018). "Tottenham unveil spectacular feature for £850m new stadium which will delight the fans". football.london. ^ Prior, Grant (8 March 2018). "White Hart Lane crushed aggies form new Spurs stadium floors". Construction Enquirer. ^ "New stadium - latest photos - Shelf Bar and LED". Tottenham Hotspur. 19 April 2018. ^ "The Tottenham Hotspur Stadium: Welcome Home - Your Guide" (PDF). Tottenham Hotspur. Retrieved 12 March 2019. ^ a b Ouzia, Malik (5 October 2018). "New Tottenham stadium: Pitch is laid as Spurs unveil 'world-first' technology". The Evening Standard. Retrieved 6 October 2018. ^ a b Gold, Alasdair (28 March 2019). "15 astonishing facts about Tottenham Hotspur's new stadium - Everything you need to know". football.london. Retrieved 29 March 2019. ^ Gold, Alasdair (11 March 2019). "New Tottenham stadium: Naming rights & Nike, the corner space 'issue', test events and 55 photos". football.london. Retrieved 12 March 2019. ^ "Spurs announce Test Events for new stadium". Sky Sports. 24 July 2018. Retrieved 24 July 2018. ^ Gold, Alasdair (11 August 2018). "New Tottenham stadium: Whether ground will be ready on time, test events & stunning new photos". football.london. Retrieved 14 November 2018. ^ Law, Matt (9 November 2018). "Tottenham staff given sneak preview of spectacular new stadium". The Daily Telegraph. Retrieved 14 November 2018. ^ Menno, Dustin (24 July 2018). "Tottenham confirm two test events ahead of new stadium opening". Cartilage Free Captain. Retrieved 11 October 2018. ^ "Tottenham stadium Q&A: What has to happen before they move in?". Sky Sports. 23 December 2018. Retrieved 24 December 2018. ^ a b Wilson, Jeremy (13 August 2018). "Tottenham forced to delay opening of new stadium until end of October after 'issues with critical safety systems". The Daily Telegraph. Retrieved 14 August 2018. ^ "Tottenham stadium delay down to 'faulty wiring', says Mace". Sky Sports. 23 August 2018. Retrieved 24 August 2018. ^ "Spurs stadium: The story so far". Building. 2 April 2019. Retrieved 11 April 2019. ^ "Tottenham stage 'fan familiarisation event' at new White Hart Lane stadium". Sky Sports. 17 December 2018. ^ Bhardwaj, Vaishali (24 March 2019). "New Tottenham stadium test event: J'Neil Bennett makes history as Spurs U18s beat Southampton". Evening Standard. Retrieved 24 March 2019. ^ "Tottenham: New stadium to be used competitively in first week of April". BBC Sport. 8 March 2019. Retrieved 8 March 2019. ^ "Spurs Legends 4-5 Inter Forever: Gazza cameo in thriller at new stadium". Sky Sports. 30 March 2019. Retrieved 20 March 2019. ^ "Legends Thrill Fans at New Stadium". THFC. 30 March 2019. Retrieved 31 March 2019. ^ "Premier League fixtures 2018-19: Man City visit Arsenal on opening weekend". BBC Sport. 14 June 2018. Retrieved 14 June 2018. ^ Kilpatrick, Dan (3 September 2018). "Tottenham confirm Wembley date for Manchester City match and stadium will stage Champions League group stage". Evening Standard. Retrieved 3 September 2018. ^ Aarons, Ed (26 October 2018). "Tottenham confirm they will not play in new stadium until 2019". The Guardian. Retrieved 26 October 2018. ^ a b Burrows, Ben (17 March 2019). "Tottenham new stadium: Spurs confirm Crystal Palace as first fixture at new home". The Independent. Retrieved 17 March 2019. ^ "Tottenham given permission to move Watford Carabao Cup tie to Milton Keynes". Sky Sports. 5 September 2018. ^ "Raiders face Seahawks in first game at new Tottenham stadium". Reuters. 12 January 2018. Retrieved 27 June 2018. ^ Pearce, Ben. "Tottenham open biggest club shop in Europe at new stadium, no confirmed date for first match". ESPN. ^ Rosser, Jack (3 April 2019). "Tottenham Hotspur stadium opening ceremony: Spurs pay homage to regeneration of local area after 2011 riots". Evening Standard. Retrieved 4 April 2019. ^ Burt, Jason; Tyers, Alan (3 April 2019). "Son Heung-min writes his name in Spurs folklore with first goal in Tottenham's new stadium". The Telegraph. Retrieved 4 April 2019. ^ McNulty, Phil (3 April 2019). "Tottenham Hotspur 2–0 Crystal Palace". BBC Sport. Retrieved 4 April 2019. ^ "Tottenham Hotspur Design and Access Statement 2015: Design Response". Haringey Council. Retrieved 27 July 2018. ^ a b "Tottenham Hotspur Design and Access Statement 2015: Overview". Haringey Council. Retrieved 25 July 2018. ^ a b c Blum , Ronald (1 April 2019). "Tottenham Stadium follows US financing model". Washington Post. Retrieved 1 April 2019. ^ a b c d e "Tottenham Hotspur Football Club". Populous. ^ "Northumberland Development Project (Tottenham Hotspur Stadium)" (PDF). Greater London Authority. 27 October 2015. Retrieved 20 April 2019. ^ a b c d e "Tottenham Hotspur Design and Access Statement 2015: Part 7.5". Haringey Council Services. ^ Gold, Alasdair (24 April 2018). "Spurs unveil impressive feature that will transform the outside of their new £850m stadium". football.london. Retrieved 6 July 2018. ^ "Pitch lights will be LED, says Spurs". LUX. 6 March 2018. Retrieved 12 July 2018. ^ Gold, Alasdair (17 May 2018). "New Spurs stadium: Latest photos, video and completion date as we walk around site". football.london. ^ "Tottenham Hotspur Selects Daktronics To Provide LED Video Displays For New Stadium". Daktronics. ^ "Daktronics to supply LED displays for new Tottenham stadium". TheStadiumBusiness. 27 March 2018. ^ "LG". Tottenham Hotspur. Retrieved 30 October 2018. ^ a b c d McGurk, Stuart (23 January 2017). "Spurs stadium designers: "We've built it like a concert hall"". GQ. ^ Dutton, Tom (29 December 2016). "Tottenham's new stadium will have better atmosphere than Arsenal's Emirates, says Spurs director Donna-Maria Cullen". Evening Standard. ^ Megson, Kim (20 January 2017). "White Hart Lane: Populous MD lifts the lid on the design of Tottenham's community-driven new stadium". Clad News. ^ Hytner, David (24 March 2019). "Intimacy, awe and a salute to Gazza: Spurs throw open doors to new home". The Guardian. Retrieved 24 March 2019. ^ Pachniuk, Matthew (2 October 2015). "Spurs' new stadium interior designed to enhance fan views". Cartilage Free Captain. Retrieved 26 March 2019. ^ a b c "Welcome to Our New Home" (PDF). Tottenham Hotspur. Retrieved 11 January 2019. ^ "Behind the Design: The Single-Tier Stand to Drive Atmosphere of Tottenham Hotspur's New South Stand". Populous. 21 December 2017. Archived from the original on 6 April 2018. ^ a b c Stone, Simon (24 March 2019). "Tottenham: A glimpse inside Spurs' new £1bn state-of-the-art stadium". BBC Sport. Retrieved 25 March 2019. ^ "New Spurs stadium: tunnel views at eyewatering prices". The Week. 20 January 2017. Retrieved 21 July 2018. ^ Moore, Rowan (30 March 2019). "Spurs' new stadium: let's call it a home win". The Observer. Retrieved 7 April 2019. ^ "Tottenham's new stadium to have 15,000 seats ripped out after building blunder". talkSPORT. 27 June 2018. ^ "Welcome Home - Secure Your Seat and 'Look Around' the New Stadium". Tottenham Hotspur Football Club. ^ Gold, Alasdair (19 April 2017). "Seven key answers about Spurs' new stadium including if White Hart Lane's cockerels will be saved". football.london. ^ Dean, Sam (26 June 2018). "Tottenham's new stadium has been 'future-proofed' for safe standing". Daily Telegraph. Retrieved 6 July 2018. ^ Ziegler, Martyn (27 July 2018). "Tottenham Hotspur can convert to safe-standing within an hour". The Times. Retrieved 27 July 2018. ^ "Club's future-proofed areas offer new concept in safe standing debate". Tottenham Hotspur F.C. 25 June 2018. Retrieved 26 March 2019. ^ "Welcome Home - Secure Your Seat and 'Look Around' the New Stadium". Tottenham Hotspur Football Club. 12 March 2018. Retrieved 13 July 2018. ^ Smith, Adam (16 August 2017). "Will the bigger Wembley pitch affect Tottenham this season?". Sky Sports. ^ a b "Tottenham Hotspur Design and Access Statement 2015". Haringey Council. ^ Young, Alex (7 September 2017). "Tottenham give impressive first look at 'world-first dividing retractable pitch' for new stadium". Evening Standard. ^ "Tottenham Hotspur will have world's first dividing retractable pitch, so they can host football and NFL". The Daily Telegraph. 7 September 2017. ^ Prior, Grant (26 January 2018). "Installation work starts on Spurs retractable pitch". Construction Enquirer. ^ Hastings, Rob (24 January 2017). "Spurs are starting a stadium design revolution in Tottenham". iNews. Retrieved 20 July 2018. ^ Conway, Richard (26 September 2018). "Spurs' new stadium 'will be greatest ever built' says chief engineer". BBC Sport. ^ Gold, Alasdair (9 September 2018). "Revealed: What the new metal structures fans have spotted at Spurs' new stadium are for". football.london. ^ Edwards, David (3 June 2016). "Architect Christopher Lee from Populous talks modern stadium design". The Daily Telegraph. Retrieved 12 July 2018. ^ a b Hayward, Paul (25 March 2019). "Tottenham Hotspur's new ground eclipses north London rivals' Emirates Stadium – it was worth the long wait". The Telegraph. Retrieved 2 April 2019. ^ "Our Feature Bars". Tottenham Hotspur Football Club. Retrieved 12 July 2018. ^ "Tottenham's new stadium: Watch the opening ceremony on Sky Sports". Sky Sports. 29 March 2019. Retrieved 4 April 2019. ^ "Levy UK and Tottenham Hotspur announces winning food and drink offering for new stadium". Compass. 21 June 2018. Retrieved 12 July 2018. ^ Burt, Jason (20 January 2017). "Tottenham give taster of new stadium... with its own micro brewery". The Daily Telegraph. Retrieved 8 July 2018. ^ "Beavertown to open Microbrewery at Club's new stadium". Tottenham Hotspur. 30 May 2018. Retrieved 13 July 2018. ^ Nuttall, Chris (4 April 2019). "Spurs stadium's wireless wonders". Financial Times. Retrieved 4 April 2019. ^ Bicheno, Scott (3 April 2019). "Spurs and HPE hope to show how stadium wifi should be done". Telecoms. Retrieved 4 April 2019. ^ "Real Wireless: Tottenham Hotspur Stadium – the Best-Connected in the UK". Business Wire. 18 April 2019. Retrieved 24 April 2019. ^ Blunden, Mark (20 January 2017). "New Tottenham stadium: Tunnel Club, Michelin-calibre food and even a micro-brewery - The premium side of Tottenham's new stadium". Evening Standard. Retrieved 11 July 2018. ^ Gold, Alasdair (26 June 2017). "Details of new Spurs stadium's £20m roof emerge with luxury restaurant that will 'hang from it'". football.london. Retrieved 12 July 2018. ^ Lawrence, Amy (20 January 2017). "Big cheeses: Tottenham's new stadium to give half-time snacks fancy flavour". The Guardian. Retrieved 7 November 2018. ^ "Tottenham Experience". iSpurs. Retrieved 13 July 2018. ^ Kilpatrick, Dan (3 April 2019). "Inside Tottenham's stadium: 10 brilliant features to look out for at first game against Crystal Palace". Evening Standard. Retrieved 20 April 2019. ^ Ravenscroft, Tom (3 April 2019). "Populous completes "best stadium in the world" for Tottenham Hotspur". De Zeen. Retrieved 20 April 2019. ^ Gold, Alasdair (10 September 2018). "Tottenham are adding something classy to their new stadium and the fans are going to love it". football.london. Retrieved 9 October 2018. ^ Hawkins, Billy (7 November 2018). "ICONIC Tottenham new stadium update: Golden Cockerel arrives and is pictured on top of the South Stand". Talk Sport. Retrieved 7 November 2018. ^ "A fitting place for Bill in new stadium plans". Tottenham Hotspur Football Club. Retrieved 21 July 2018. ^ Kilpatrick, Dan (20 January 2017). "Tottenham want Premier League's best atmosphere in building new stadium". ESPN. Retrieved 8 July 2018. ^ "NFL London: Schedule announced for Tottenham Stadium & Wembley games". BBC Sport. 17 April 2019. Retrieved 17 April 2019. ^ "Saracens to play annual showpiece at Tottenham Hotspur Stadium". BBC. 2 April 2019. Retrieved 2 April 2019. ^ a b Gold, Alasdair (5 April 2019). "Three things we loved about Tottenham's new stadium and three things we didn't". football.london. Retrieved 4 April 2019. ^ a b c Kilpatrick, Dan (4 April 2019). "Smaller than Emirates Stadium? Why Tottenham may struggle to fill 62,062 capacity at £1bn new home". Evening Standard. Retrieved 6 April 2019. ^ "When is a capacity not a capacity – Ask Spurs or Arsenal!". Sportsvibe. 5 April 2019. Retrieved 17 April 2019. ^ Gott, Tom (5 April 2019). "The Reason Why Tottenham Hotspur Did Not Have Full Capacity for First Match at New Stadium". 90Min. Retrieved 6 April 2019. ^ "Project Appraisal From - Stage 2: Investment Decision". London.gov.uk. Archived from the original on 2 September 2012. ^ Collomosse, Tom (8 March 2017). "New Tottenham Stadium: Tottenham reveal cost of new ground has risen to £800 million". Evening Standard. ^ Prior, Grant (16 August 2018). "Spurs stadium builders "earning more than the players"". Construction Enquirer. Retrieved 21 August 2018. ^ Law, Matt (21 September 2018). "Tottenham insist suggestions of £1.2bn final stadium bill are inaccurate". The Telegraph. Retrieved 3 April 2019. ^ "Tottenham: New stadium can make Spurs one of world's biggest clubs, says Chairman Daniel Levy". BBC. 2 April 2019. Retrieved 3 April 2019. ^ "Spurs secure £400m bank loan to complete £740m stadium build". Inside Football World. 1 June 2017. ^ Collomosse, Tom (31 May 2017). "New Tottenham stadium: Spurs announce £400million loan deal to help finance new stadium". Evening Standard. ^ Reilly, Alasdair (31 May 2017). "LPC-Tottenham Hotspur nets £400m stadium loan". Reuters. ^ Pitt-Brooke, Jack (30 October 2018). "New Tottenham stadium: Spurs forced to borrow another £237m as costs continue to spiral". The Independent. Retrieved 30 October 2018. ^ Dan Kilpatrick (21 April 2017). "NFL helping fund new Tottenham Hotspur stadium - sources". ESPN. Retrieved 4 April 2018. ^ "Heineken named as official beer partner for Tottenham Hotspur's Iconic new stadium". Tottenham Hotspur Football Club. 18 May 2018. Archived from the original on 16 June 2018. Retrieved 7 June 2018. ^ Powell, Tom (30 May 2018). "Tottenham Hotspur team up with Beavertown to create world's first microbrewery in a football stadium". Evening Standard. ^ "TGI to deliver perimeter advertising system at club's new world-class stadium". Tottenham Hotspur Football Club. 31 May 2018. Retrieved 4 June 2018. ^ "LG Chosen to Supply Ultra-Premium TVS and Digital Signage across new stadium". Tottenham Hotspur Football Club. 1 June 2018. Retrieved 4 June 2018. ^ "Hewlett Packard Enterprise to support technology vision for new vision". Tottenham Hotspur Football Club. 11 July 2018. Retrieved 1 August 2018. ^ Gill, Oliver (28 March 2019). "The businesses making Tottenham Hotspur's new £1bn stadium the envy of its Premier League rivals". The Telegraph. Retrieved 4 April 2019. ^ Smith, Rory (April 3, 2019). "Tottenham Hotspur Stadium Opens: Is There Room for Everyone?". The New York Times. Retrieved 10 April 2019. ^ Winter, Henry (26 March 2019). "Tottenham Hotspur's new stadium should be a source of pride for all of football". The Times. Retrieved 10 April 2019. ^ a b "How to get to White Hart Lane Stadium in Tottenham by Bus, Tube or National Rail". Moovit. ^ "New Stadium Getting Here". Tottenham Hotspur F.C. Retrieved 10 April 2019. ^ Ibrahim, Magda (4 April 2019). "TfL passengers 'like cattle' on London Underground after first match at new Tottenham stadium". Retrieved 24 April 2019. ^ a b "Transport". Tottenham Hotspur. ^ "Shuttle Bus Services". Tottenham Hotspur F.C. Retrieved 24 April 2019. ^ "Road Closures Local Information". Ask Spurs. Retrieved 4 April 2019. ^ Coleman, Joe (8 March 2019). "FINALLY Tottenham Hotspur Stadium latest: Fans believe stadium could be opened NEXT WEEK as Haringey council pass Road Traffic Order for March 16". talkSport. Retrieved 20 April 2019. ^ "Tottenham Event Day CPZ map". Haringey Council. Retrieved 8 April 2019. 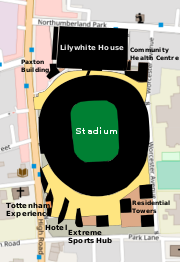 Wikimedia Commons has media related to Tottenham Hotspur Stadium.